This hands-on manual from Leigh McCullough and associates teaches the nuts and bolts of practicing short-term dynamic psychotherapy, the research-supported model first presented in Changing Character, McCullough's foundational text. 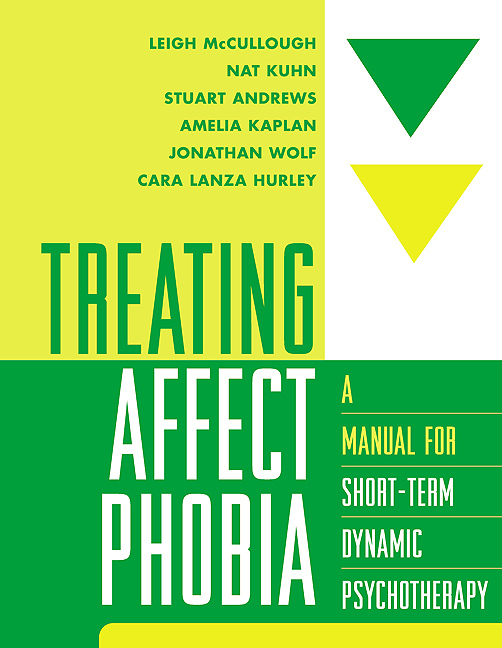 Reflecting the ongoing evolution of the approach, the manual emphasizes "affect phobia," or conflict about feelings. It shows how such proven behavioral techniques as systemic desensitization can be applied effectively within a psychodynamic framework, and offers clear guidelines for when and how to intervene. Demonstrated are procedures for assessing patients, formulating core conflicts, and restructuring defenses, affects, and relationship to the self and others. In an easy-to-use, large-size format, the book features a wealth of case examples and write-in exercises for building key clinical skills. The companion website (www.affectphobiatherapy.com) offers useful supplemental resources, including Psychotherapy Assessment Checklist (PAC) forms and instructions.